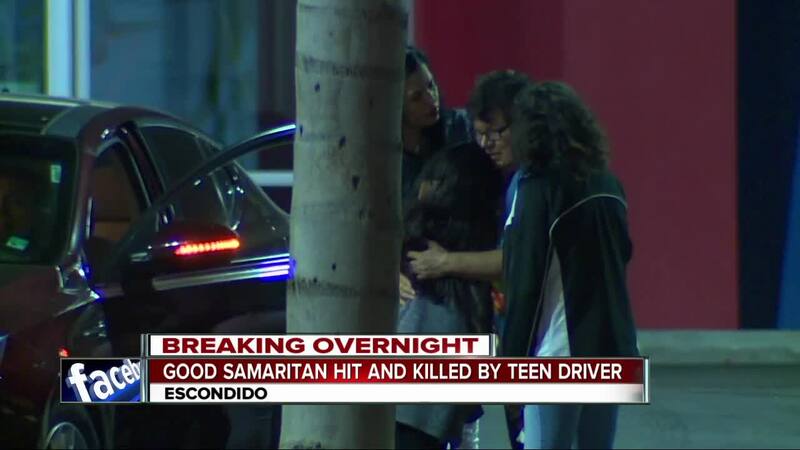 ESCONDIDO, Calif. - A man helping a family whose SUV broke down on the side of a California road was struck and killed by a vehicle driven by a teen. According to authorities, a Jeep Cherokee SUV experienced mechanical issues shortly after 11 p.m. Sunday and pulled over along eastbound state Route 78 near the intersection of Broadway in Escondido, California. Several drivers stopped to assist the Jeep’s driver while his family waited on the side of the road. As a good Samaritan pushed the Jeep from behind, an oncoming Toyota RAV4 crashed into his stopped car -- sending that vehicle into the back of the Jeep and running over the good Samaritan. The victim, who was not identified, was taken to the hospital but passed away from his injuries. The Jeep’s driver was also hospitalized with what was described as head trauma. The RAV4’s driver, identified as a 17-year-old boy, fled from his vehicle. He was located at a nearby restaurant about an hour later. With his parents, the boy returned to the scene and turned himself in to authorities. He was arrested on suspicion of driving under the influence, according to the California Highway Patrol. CHP officials said a loaded handgun, as well as drugs and drug paraphernalia, were found inside the RAV4.